This entry was posted in Kitchen Tools 廚房小助手, My Kitchen 媽媽廚房, Shopping 購物狂 and tagged Kitchen Tools 廚房小助手, Le Creuset stonewares, My Kitchen 媽媽廚房, Shopping 購物狂, 年尾大減價- 再敗廚房用品 on January 8, 2014 by Mommy. 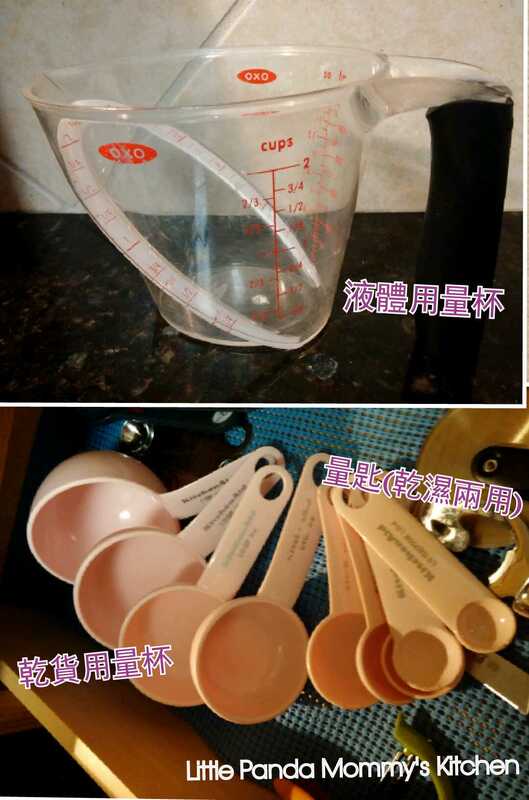 This entry was posted in Kitchen Tools 廚房小助手, My Kitchen 媽媽廚房, 廚房新手學堂 and tagged Kitchen Tools 廚房小助手, My Kitchen 媽媽廚房, 廚房新手學堂, 新手學堂 － 認識量杯 on January 3, 2014 by Mommy. This entry was posted in Kitchen Tools 廚房小助手, My Kitchen 媽媽廚房, Shopping 購物狂, 攝影室 and tagged Kitchen Tools 廚房小助手, LC新成員＋新廚房助手, Le Creuset 30cm buffet Costal Blue, My Kitchen 媽媽廚房, Shopping 購物狂, 攝影室 on December 30, 2013 by Mommy. 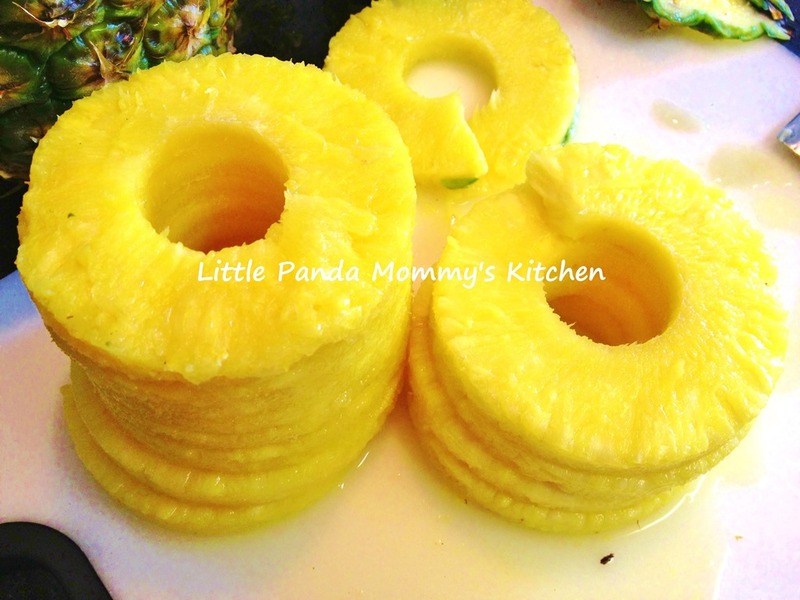 This entry was posted in Kitchen Tools 廚房小助手, Little Panda Mommy's Family 生活點滴, My Kitchen 媽媽廚房, Shopping 購物狂, 攝影室 and tagged Christmas ＆Birthday gifts 2013, Kitchen Tools 廚房小助手, Little Panda Mommy's Family 生活點滴, My Kitchen 媽媽廚房, Photography, Shopping 購物狂, 攝影室, 生日聖誔禮物2013 on December 29, 2013 by Mommy. This entry was posted in Kitchen Tools 廚房小助手, My Kitchen 媽媽廚房, Shopping 購物狂 and tagged Granite cutting board, granite mortar & pestle, Kitchen Tools 廚房小助手, Le Creuset, My Kitchen, shopping, Wooden cutting board, 再敗廚房小助手, 媽媽廚房, 廚房小助手 on September 24, 2013 by Mommy. This entry was posted in Kitchen Tools 廚房小助手, My Kitchen 媽媽廚房, Shopping 購物狂 and tagged bake dish, Le Creuset Bakeware, salt and pepper shaker, salt pig on September 4, 2013 by Mommy. This entry was posted in Kitchen Tools 廚房小助手, My Kitchen 媽媽廚房, Shopping 購物狂 and tagged Shopping 購物狂，My Kitchen 媽媽廚房，snapware-玻璃密實盒，Kitchen Tools 廚房小助手 on August 9, 2013 by Mommy. 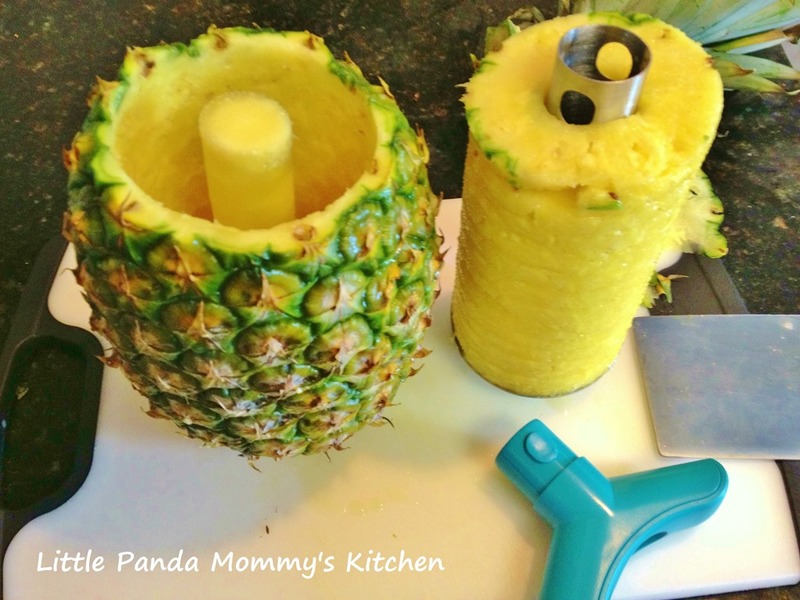 I have heard about the pineapple slicer for quite a while. Every time I saw a presentation on TV, I went online and checked out the product reviews, which were half good and half bad. 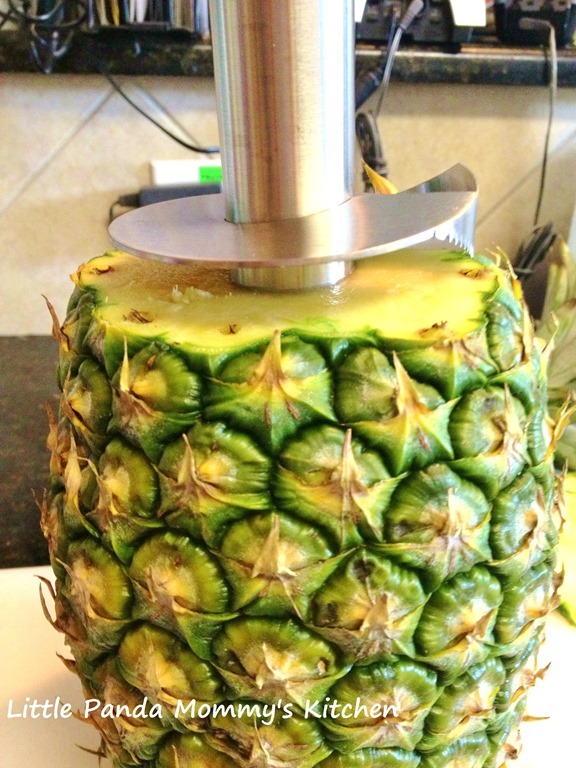 Some people said it was easy to use while others said it was hard to turn and pull the sliced pineapple out. That stopped me from ordering. Luckily, my loving and generous parent-in-laws, who know how much I love single purpose tools, got me this new toy to add-on my kitchen tools collection. 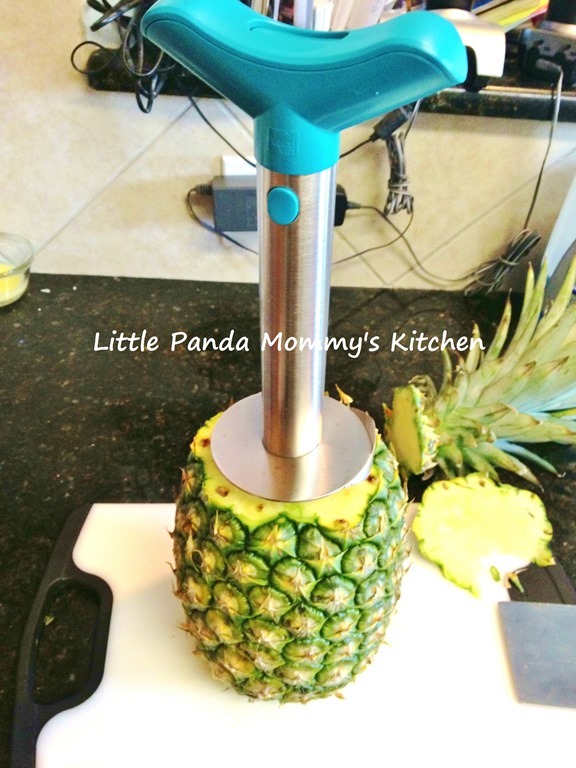 This pineapple slicer comes in 2 parts: the blue top rubble handle and the metal body. 1. Simply cut off the top of the pineapple, then push the circle bottom into the middle of the pineapple (the core). 2. 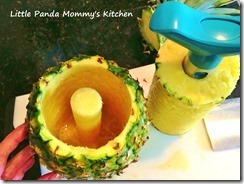 Hold the pineapple body with one hand, turn the blue handle clockwise with the other hand until the bottom are reached, where the tool stops going down and it is time to pull. 3. 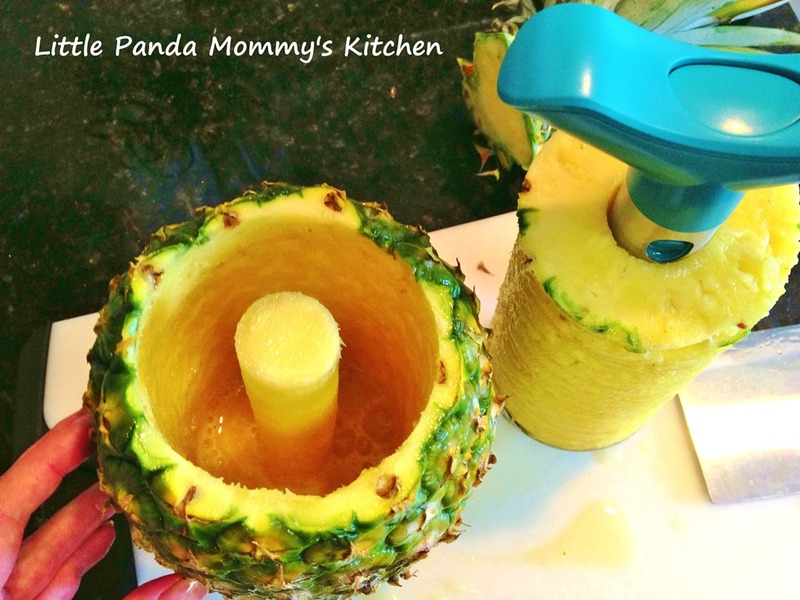 Push the top button (on top of blue handle) to release handle, flip the tool upside down and the pineapple will slide down. 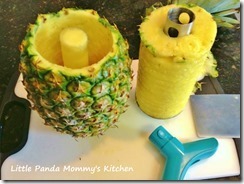 Pulling the spiral pineapple apart to loosen up will help this process. The tool is much better than I imagined. Some users complained it was hard to turn and pull. 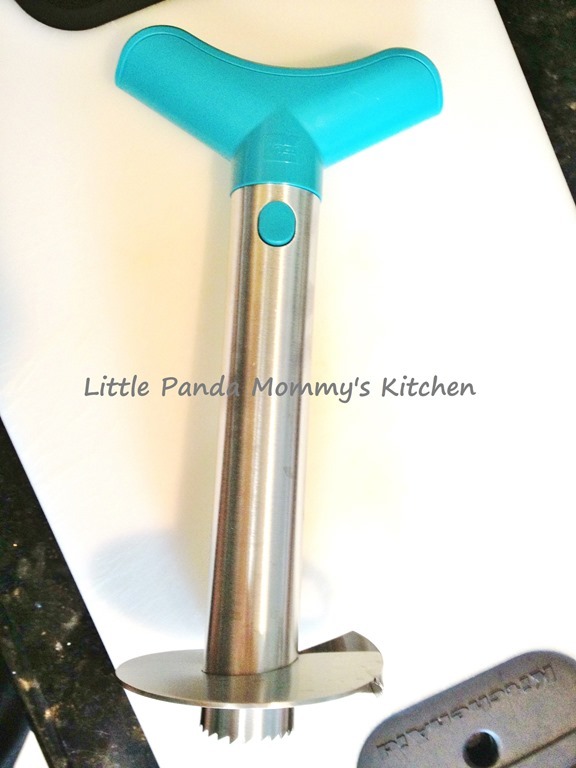 As a petite size woman, not at all strong, I found this tool really easy to use and clean. Since the slicing all happened inside the pineapple, the juice is well contained. That means no mess, no spill or sticky counter top to clean afterward. 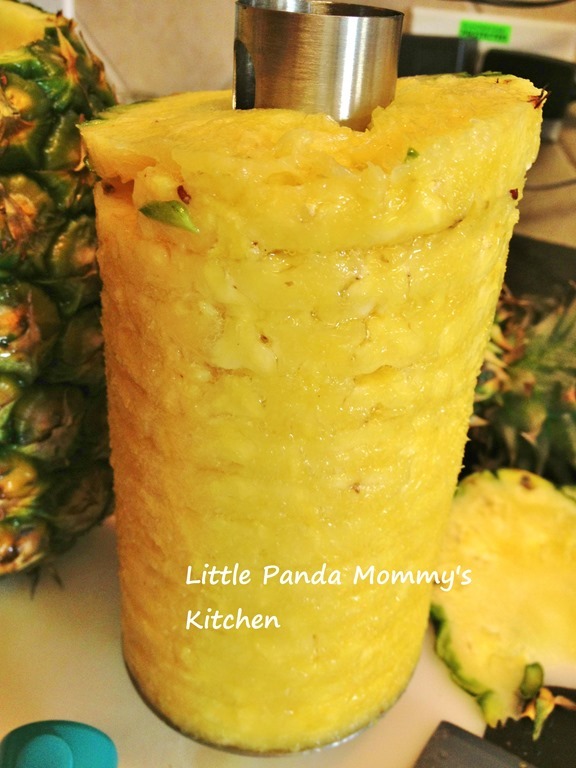 The pineapple was evenly sliced and very little fresh was left behind. 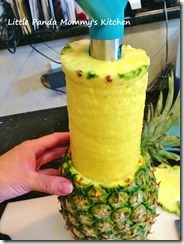 It was the best way I ever tried to slice a pineapple. Loving it. Another benefit? 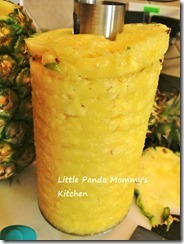 Cut the core of the pineapple with a knife, then you have a beautiful container to serve beverage. Bonus. 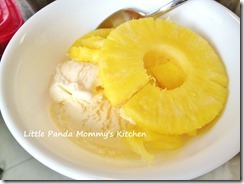 Now, it is time to enjoy some sweet and juicy pineapple with vanilla ice cream, a nice way to cool off in this hot summer day. Enjoy. Chinese Version Review, Click here. This entry was posted in Kitchen Tools Review 廚房用品用後感, Kitchen Tools 廚房小助手, My Kitchen 媽媽廚房 and tagged Kitchen Tool, Pineapple Slicer, Review on July 16, 2013 by Mommy. 媽媽對於單獨用途的各種廚房工具愛不釋手,老爺奶奶亦深明此理.他們說將會努力尋找不同的廚房小工具,讓我玩過不亦樂乎. 數周前,他們訂了下圖的廚房小助手給我 – 菠蘿切片器.媽媽在電視廣告和烹飪節目中看過這小工具很多次,但參考過不同的用家評價後,因評語好壞參半,所以遲遲沒有購買.結果,兩個老人家再次巧合地送我想試很久的小玩意(基本上,送任何廚房小助手都會合心意,因為太好奇又好想試玩 ),媽媽可以親身試用和寫用後感. 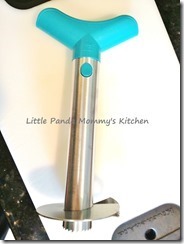 This entry was posted in Kitchen Tools Review 廚房用品用後感, Kitchen Tools 廚房小助手, My Kitchen 媽媽廚房, Reviews 產品評價, Shopping 購物狂 and tagged 菠蘿切片器，Kitchen Tools Review 廚房用品用後感，Kitchen Tools 廚房小助手， My Kitchen 媽媽廚房 on July 16, 2013 by Mommy. This entry was posted in Kitchen Tools Review 廚房用品用後感, Kitchen Tools 廚房小助手, Reviews 產品評價, Shopping 購物狂 and tagged 10分鐘雪條機, Kitchen Tools Review 廚房用品用後感, Kitchen Tools 廚房小助手, My Kitchen 媽媽廚房, Reviews 產品評價, Shopping 購物狂 on July 3, 2013 by Mommy.